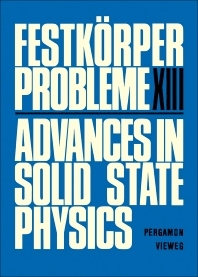 Festkorper Probleme XIII: Advances in Solid State Physics is a collection of papers from plenary lectures of the solid states division of the German Physical Society in Munster, on March 19-24, 1973. This collection deals with semiconductor physics, surface phenomena, and surface physics. One paper reviews the findings on experiments on the magnetic, optical, electrical, and structural properties of layer type crystals, particularly metal dichalcogenides. This book then discusses the van der Waals attraction using semi-classical methods to explain the correlation in different atoms. This discussion explains the application of the Schrodinger formalism and the Maxwell equations. One paper also reviews the energy distribution of electrons emitted from solids after ultraviolet radiation or monochromatic X-ray exposure. Another paper reviews the use of clean silicon surfaces associated with electron emitters showing ""negative electron affinity."" A paper then reviews the mechanism of charge-transfer devices, with emphasis on the physics of the transfer processes that happen in surface charge-coupled devices or bulk-charge-couple devices. This compendium will prove useful for materials physicists, scientists, and academicians in the field of advanced physics. The Pressure Variable in Solid State Physics: What about 4f-Band Superconductors?